Extra safe, thanks to the Isofix attachments, the Top Tether anchorage points and double type approval (9-18 and 15-36 kg, 1-12 years): the car seat that grows with your child. Dear Mom and Dad, the time has finally come to leave the infant car seat behind you! That little tyke you took home with you from the hospital has sure grown, right there in front of your eyes, almost without you noticing. For your child, this is the first important right of passage. Abandoning his first car seat (car seat group 0-1), means leaving behind a protective cocoon, and not just metaphorically speaking. So far, the infant car seat had enveloped your baby in an embrace… The very best thing in his first few months. From now on, there’s no looking back… quite literally: the car seat, mounted in the direction of travel, will finally allow him to see the world as you do. Well, almost! The right time to change car seat is when your little one reaches 9kg in weight, which could happen before he reaches his first birthday. Not sure how much your child weighs? It happens! Well then, look out for an even more eloquent signal: can you fasten his harness straps? They have probably become too short. Best not to wait till you get to this point. Get yourselves a car seat in the next group well in advance (Group 0+: until 10 Kg; Group 1: 9-18 Kg; Group 2: 15-25 Kg: Group 3: 22-36 Kg). It’s a question of your child’s safety and comfort. However, don’t rush to get rid of his first car seat: if the size of the baby, mainly his height, allows it, you can go on using it for a bit longer. If your car is fitted with Isofix attachments, you really should choose a car seat that connects to these fasteners, which are the best safety device currently available on the market. As regards the model, you should be looking for a product in Group 1 (9-18 Kg). Have you ever thought of a multi-group seat? In addition to the intermediate group-based solutions that need to be changed as your child grows (aged 0-1, 1-4, 2-3, etc. ), you can now choose a new definitive solution: a child seat in Group 1-2-3. 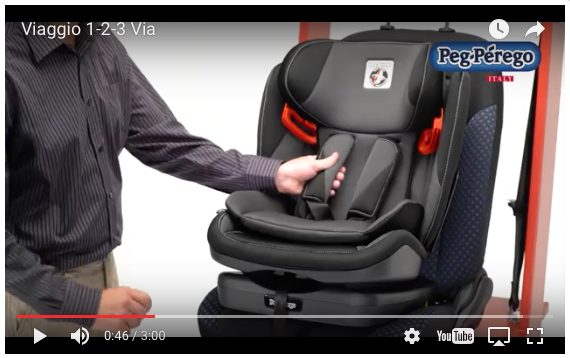 You can start using this particular car seat when your child is under one year of age, provided he weighs over 9 kg, and you’ll never have to change it again. Like a loyal friend, he’ll remain at your side for years. Viaggio 1•2•3 Via is unique: that’s why you’ll never want to change it! 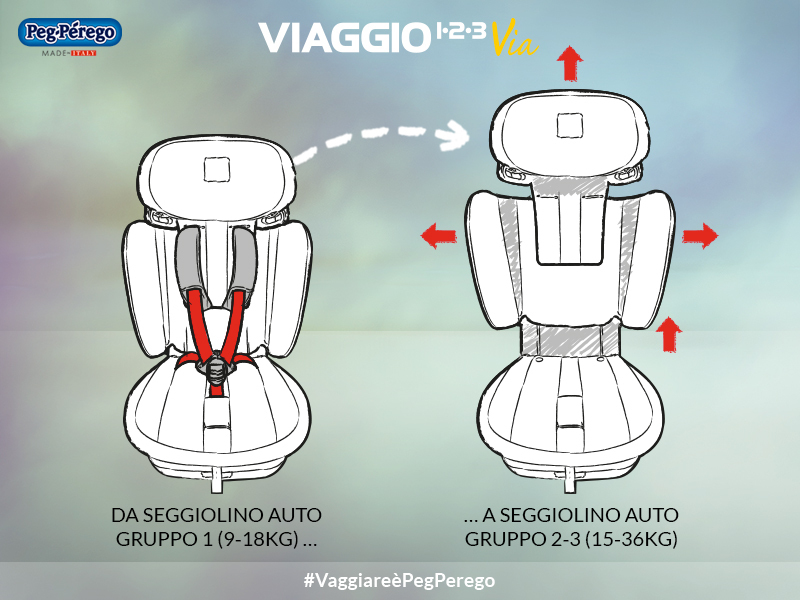 For all those moms and dads who don’t want to keep changing car seats every two or three years, the solution is the brand new Peg Perego Viaggio 1•2•3 Via. With its double type approval (group 1 universal and group 2-3 semi universal), it meets the needs of everyone in the family: mom, dad, the grandparents… and even the children themselves! On the one hand, you grown ups can rest assured that you have adopted maximum safety in the car for your children (the All Side Impact Protection system protects all sensitive points of the body); on the other, your children will be able to travel on a more comfortable and flexible seat that will accompany them as they grow. • Even beginners will be able to install it with ease thanks to the handy colour coding: all you have to do is ‘click’ the car seat’s fasteners onto your vehicle’s Isofix attachments. • Your child’s safety is also guaranteed by the Top Tether, an additional anchorage point that secures the child seat using the relevant belt. • The seat is reinforced with steel tubes, while the headrest and side wings also protect taller children. • Unexpected release is avoided by the Blind Lock coupling system, which prevents another passenger, such as a brother or sister, from inadvertently unfastening the seat from its tethers. • The car seat can easily be moved from car to car, and looks attractive on the rear seat of the vehicle thanks to its modernly elegant design. • If you are a bit of an extrovert, you can choose from a range of colourful versions, and lovers of fine details will appreciate its refined finish. “My child must be comfortable and safe!” This is the most common concern among mothers. No worries, because Viaggio 1•2•3 Via has all it takes to meet your needs. It protects all the sensitive areas of your baby’s little body with the 4D Total Adjust system. Moreover, the wraparound headrest adjusts in 6 different positions relative to the backrest, and the width varies by up to 6 cm thanks to special side protections, so as to adapt to your child as he grows. Sweet dreams on the road: the seat is anatomical and can easily be reclined in 5 different positions using just one hand, to let your child sleep comfortably while travelling, even when he is a little older. This feature is very important when the child is still small and has just switched from a group 0 car seat to his brand new cocoon. 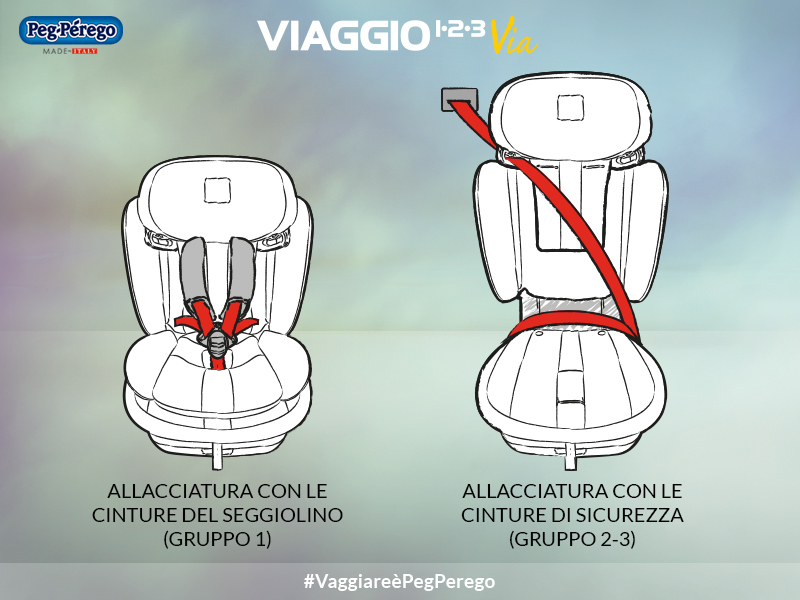 Choosing a car seat like Viaggio 1•2•3 Via does not just mean investing in the safety and comfort of your children; in the long run, it also means saving money and optimising on space. Purchasing this type of car seat is cheaper than buying two in various progressive groups. Furthermore, having a single car seat means not having a second or third one lying around the house or in the garage if you have more than one child. A single car seat: a single purchase offering many advantages for the entire family.